Sometimes being a stay at home mom makes me feel like I’m in the movie Groundhog Day. I mean – don’t get me wrong, I love staying home with Theo. I feel grateful to be able to do it. 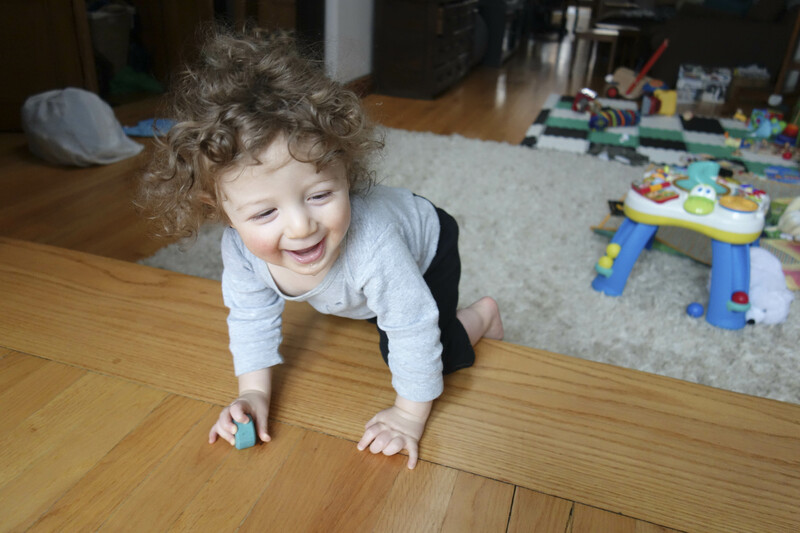 I am getting to know him so well – what makes him laugh, what makes him cranky, signs that he’s tired, hungry, excited, curious, bored or about to poop. I get to witness everything. We’re building a strong bond – the two of us. And I wouldn’t trade that for anything. But truth be told… sometimes I’m bored as hell. We have a room full of toys – but we play with them every day! There are the nesting cardboard boxes, the nesting cups, the ball activity table (love this toy), the puzzles, the shape sorters, the car, train, truck, school bus (love this toy). At least once a day we pull all the stuffed animals off the chair and put them back on and then pull them off again. We play with the sock monkey jack-in-the-box for a good five minutes. We look out the window, we read two crates full of books – our favorites a few times in a row. We sing songs. We play peekaboo. I throw him (gently – don’t worry) on the bed and tickle him and roll him around a bit and he giggles like crazy. We go up the stairs and down the stairs, and up the stairs and down the stairs. We throw books off the bookshelf. We put an assortment of things on our heads. We go through all the farm animal sounds. We play with the lights… “Lights ON! Lights OFF! Lights ON! Lights OFF!” We practice waving, clapping, patting, snapping, drumming, blowing kisses. We sing lullabies and he take naps (if I’m lucky). We eat lunch, a snack and dinner (daddy does breakfast while I snooze). We wash up. We do bath time. Then it’s time for bed. Theo goes to sleep and I scurry around re-nesting the boxes and the cups, placing the stuffed animals back on the chair, returning the books to the bookshelf and putting everything else back in it’s place. Then the next day we do it all over again. Like I said… Groundhog day. I mean – most weeks I try to keep myself busy with other plans as well. I have playdates with friends and take him on walks – to the market, to Target, to different sections of Brooklyn. 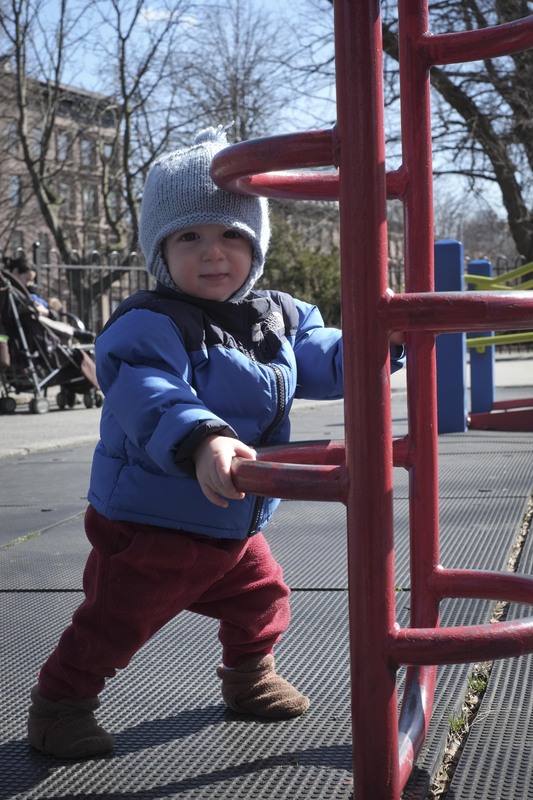 We go to the playground when it’s not super freezing. This is newly fun because he’s actually able to explore the jungle gym now (with me following right behind him of course). Occasionally we visit daddy at work in Manhattan. We actually eat lunch out quite often in Brooklyn (my favorite activity – obviously). 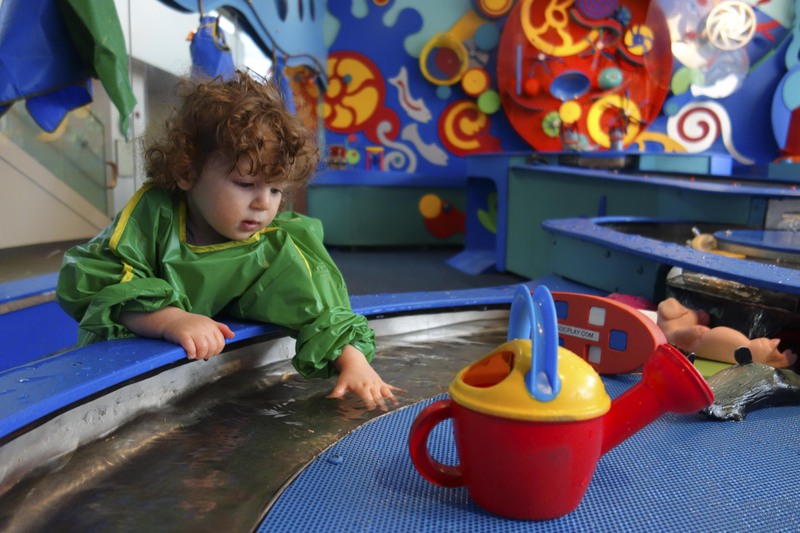 And last week I took him to the Brooklyn Children’s Museum – which was a fun change of pace. But there are some days when I have no plans, I communicate with no other adults all day and I am just bored out of my head… and kind of grumpy. And I’ll put the TV on while I’m nursing Theo and when he’s done, I’ll turn the TV towards the shag rug where we play and I’ll watch Love it or List it or The Millionaire Matchmaker or Everyday Italian with Giada while I half-heartedly play our usual games. And then I feel guilty. Am I negatively affecting his brain by exposing him to crappy reality television? I’m sure I should be coming up with more creative and stimulating things for us to do. What do other people do with their little ones all day? I begin to understand why parents buy their children like a gazillion toys! I feel like every time I buy Theo a new toy or new book it’s partially for me – so I get some variety in my play day to day too! You know? Is this silly? If I’m bored, does that mean Theo’s bored too? Or am I projecting? He’s an infant… is he still so fascinated with the world in general right now that he can play with the same things every day and be totally content? Parenting is a difficult job. Like my jobs of the past – there are good days and bad. Some days I feel stimulated and challenged – full of joy and pride. Some days I’m miserable and counting the minutes until I can put him to bed and my day as parent can finally be over! Some days I give the job my all. Some days I just don’t have my all to give – so I give what I can and that has to be enough. But for me at least, what keeps me sane (eye on the prize)… is that with this job, I care about the outcome so much more. I’m putting in my hours and my energy – my heart and soul and sweat and tears and sacrificing all the other things I could be doing. And instead of getting my satisfaction from a job well done, a paycheck and recognition from my boss and my peers – I have to find my satisfaction in the fact that I’m creating Theo’s world day to day. I’m building his foundation. It is a major long-term project – and a serious grind at times. But I’m so much more invested in the final product, so I don’t resent the sacrifice. You know? I am so proud to be the mother of wonderful you! Theo is so very fortunate to have you and I have every confidence your love, hard work, commitment and creativity will yield positive results for you and Adam, as well as Theo! awww… mommy. thank you for all your love and support! Just your fan club chiming in for a moment… I love you so much. Theo and I are simply so very lucky to have you. Truly, you’re magic. You’re Bill Murray to my Andie MacDowell. Or maybe I have that backwards, but you get the idea. Mer. Nobody has said it better. Great blog, Nell. You are creating a secure, warm, loving, sensitive human being. Watching Theo grow has been a thrill and I credit his development to all the time and effort you and Adam provide. Keep it up and your reward will be worth it. thanks daddy. 🙂 I had good examples.